This property has 3 bedrooms. 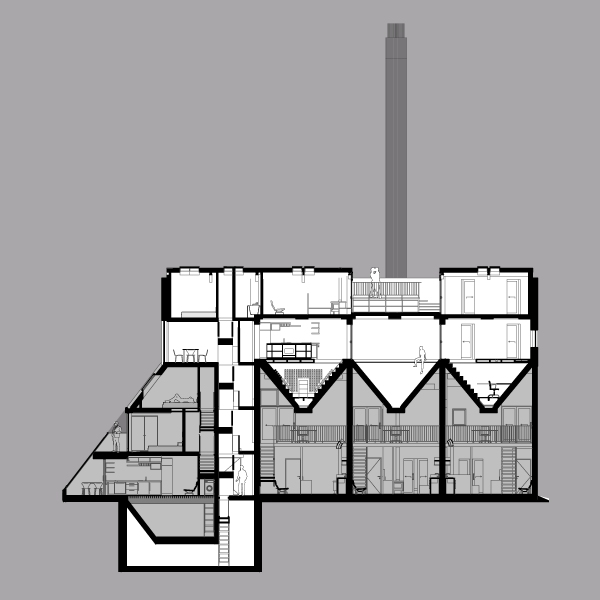 The largest property of the project, it straddles the width of the Boilerhouse and occupies the two top floors, gaining views to the south from the roof terrace deck. As can be read from the section, the property is accessed from a ground floor stair which travels up to the west facing dining hall on the third level. A vast window in the east wall will bring sunshine into the dining hall, the stairwell and by means of a glazed screen into the kitchen area. A hinge door and sliding door within this glazed screen leads you into the kitchen area with island unit for social cooking and large worktop prep surface. The kitchen also contains a hatch to one of the three hopper volumes below, this one dedicated to wine storage. 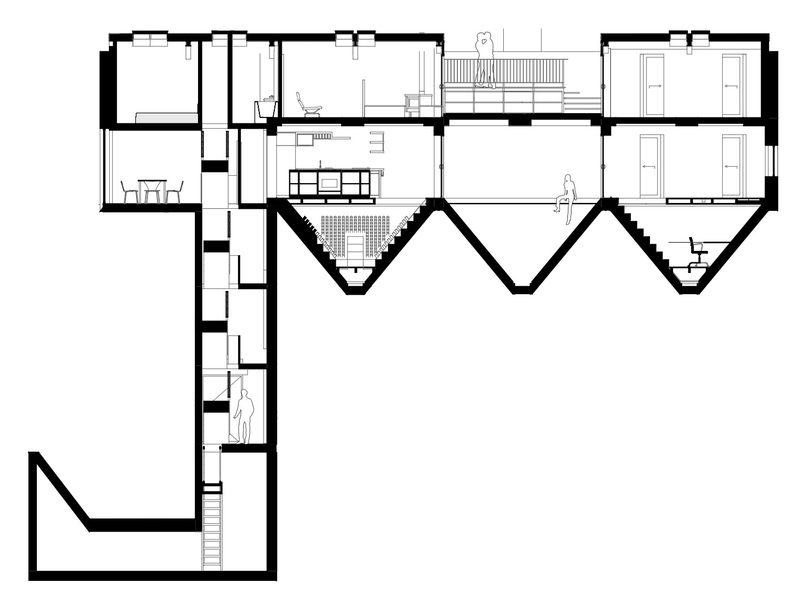 A bridge crosses the middle hopper which can be dedicated to spa use and gains light via two large skylights in the roof terrace above. The bridge leads you into bedroom with built in wardrobe and WC and shower room ensuite. A new opening in the original concrete west wall brings sunshine into this bedroom. A glazed area of flooring pulls daylight into a study area below, accessed in the final hopper via a hatch in the bedroom. Returning to the main access stair, it continues up to the fourth and top floor where a second bedroom is accessed from the landing. This bedroom is lit via a skylight in the roof. The other landing door leads into the sitting room, passing by the bathroom. The sitting room gains overhead light from a skylight above and also by means of glazed sliding door to the terrace outside. A wood-burning stove is built into the corner of the room, forming an inglenook or “snug” area. For those inclement days there is also a door to a glazed winter garden which leads you across the terrace to the third bedroom, which has built in wardrobe and WC and shower room ensuite as the level below. This bedroom is lit by skylight and by glazed doors to the terrace, like the sitting room. 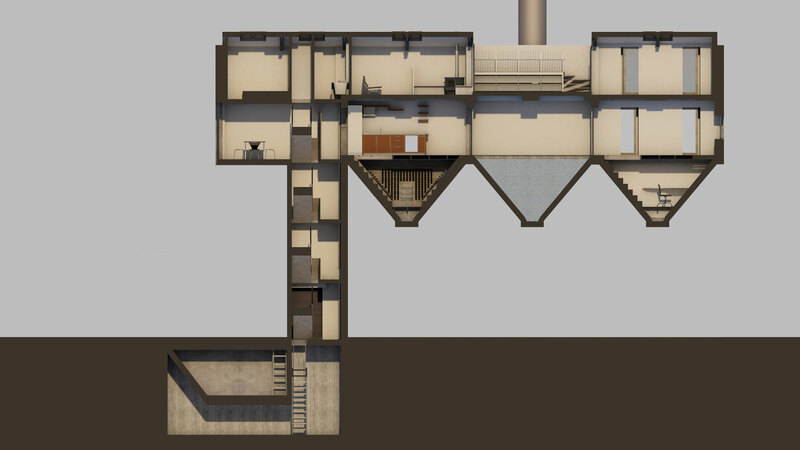 On the terrace level itself is a small winder stair which leads up to a deck, the topmost point of the project, from which the eye can see beyond the Boilerhouse with long views to the north and south. On the roof are located five solar panels for property 1 and five solar panels for property 2. An air-source heat-pump is concealed behind the louvres of the roof deck providing energy-efficient heating for the whole property. This 3 bed property plumbs the heights and depths of the building as it also has a hopper store at basement level.